Kathleen Picard Hingst, 1957 Providence Alumna, and her husband, Ronald A. Hingst, believe in the value of a Catholic education. 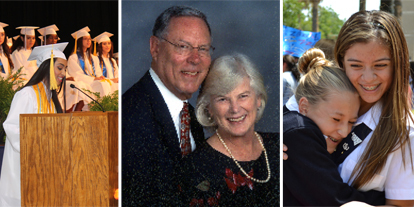 A belief so great that, in 2005, they generously gifted Providence Catholic School (Providence) with $500,000.00, in perpetuity, to establish The Hingst Family Tuition Assistance Grant (referred to as The Hingst Endowment). Providence remains deeply grateful to the Hingsts. The Hingst Endowment, a restricted investment fund, provides one-time, nonrecurring tuition assistance to a student(s) who enrolls at Providence in the ninth grade, and to a Providence graduate(s) who enrolls as a freshman at a San Antonio Catholic university. Awards are dependent on the availability of funds. Since the initial tuition assistance awards in May 2007, forty (40) Providence students’ educational experience has blossomed. This financial assistance fulfills the Hingst’s desire to provide the opportunity for young women at Providence to continue with a Catholic education. Mrs. Hingst grew up in a military family and moved often to new schools. She came to Providence as a sophomore, and was grateful to be welcomed so graciously into the Providence family. She has fond memories of her teachers and classmates, and as a “Golden Girl” cherished celebrating her 50th Class Reunion in 2007.